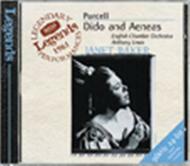 Janet Baker�s 1962 recording of Dido is a truly great performance. The radinat beauty of the voice is obvious enough, but the opening phrase of When I Am Laid in Earth and its repeat a few bars later is a model of graduated mezza voce. ... Anthony Lewis and the ECO ... produce the crispest and lightest of playing, which never sounds rushed.